ORLANDO, Fla. — The Melrose Corporation has been awarded two contracts with David Weekley Homes to provide full-service property and Lifestyle amenities management for downtown Lake Mary’s Griffin Park and Sarasota’s Payne Park Village. The communities will be managed from Melrose’s Orlando corporate office and southwest Florida regional office in Ft. Myers, respectively. Katherine Montgomery, LCAM and Vice President of The Melrose Management Partnership, the management branch of The Melrose Corporation, said her firm will supervise the management operations for Payne Park Village and Griffin Park, which was recently named the Top Luxury Residential Product by the Orlando Business Journal. Under the agreements with David Weekley Homes, The Melrose Management Partnership will provide the supervision of all community management, including HOA meetings and owner-resident relations at Griffin Park and Payne Park Village. Bill Fife, Director of Lifestyle Services for amenity management branch Melrose Lifestyle Services, will oversee the activities and events for the new communities. 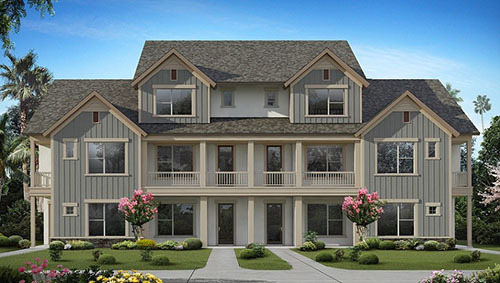 David Weekley Homes plans to build 138 homesites in Griffin Park. The private, gated community will offer five series of homes: Town Homes, City Homes, Cottages, Bungalows and Gardens. Payne Park Village has been approved for 135 residences, consisting of detached single family homes and attached multifamily units in three- to four-story buildings. David Weekley Homes estimates that this housing mix will compete in the $300s–$500s range of Sarasota homes for sale.